Keep the Halloween jack-o-lantern tradition alive, but forgo any actual flames. Using candles in jack-o-lanterns is a huge hazard, and easily avoided by using flashlights or battery operated lights. Also, be cautious in your placement of jack-o-lanterns or other luminaries. Having a well lit pathway is nice, but the close proximity of flames to high-traffic areas is not. Corn stalks or hay bales should be placed far from any flames or heat sources, as they are highly flammable. Remember, light bulbs give off heat and should never be draped with fabric, etc. Whether your trick-or-treater wants to be Thor or a kitty cat, be sure the costume is flame-retardant. Rayon, acrylic and cotton/polyester blends are the most flammable fabrics. 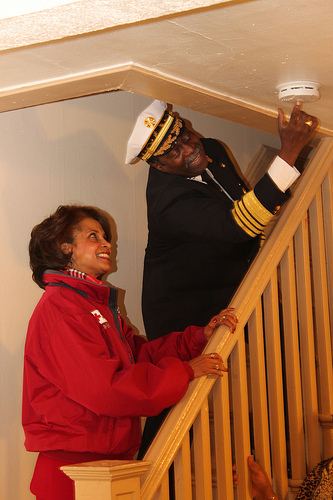 How are your smoke detectors? Change Your Clocks, Change Your Batteries is right around the corner (November 4), but it never hurts to double check the batteries in your home. It’s getting colder out there. If you’re digging out space heaters or opening up the chimney, be sure to take preventative measures. Sweep your chimney, install a fire guard and keep heaters away from flammable materials. Not only are there precautions for inside your home, but outside, too. Clear your roof and gutters of debris buildup, such as pine needles and leaves, and learn the outdoor burning regulations in your area. Burning leaves and other outdoor debris (illegal or not) can be very risky.